A Thoughtful Article about The Big Three: the Gibson Les Paul Traditional, Standard, and Classic! Jumping in the deep water: What’s my opinion on the difference between the Gibson Les Paul Standard, The Gibson Les Paul Classic, and the Gibson Les Paul Traditional? Are there things that might help me choose one for myself? My thoughts about The Big Three non-custom Top-Shelf Gibson Les Pauls! It’s no wonder that most new-to-Top-Shelf Gibson Les Paul players (and soon-to-be Top-Shelf Gibson Les Paul players!) get a bit confused on what guitar is right for them, particularly when they first aim their sights at a Les Paul. One could easily say that “just go to the store and play all three varieties, and play older ones and new ones, then buy the one that is ‘right’ for you.” As easy as that is to say, it’s very difficult to do. You can buy Gibson Les Paul Standard guitars at my favorite sponsor in the whole world! zZounds has great guarantees and prices! Not everyone can afford a new Standard. Not everyone has access to a guitar store with lots of models available to try. Not everyone can sit down in a guitar store and even concentrate long enough to get a good, thoughtful view of a given guitar. 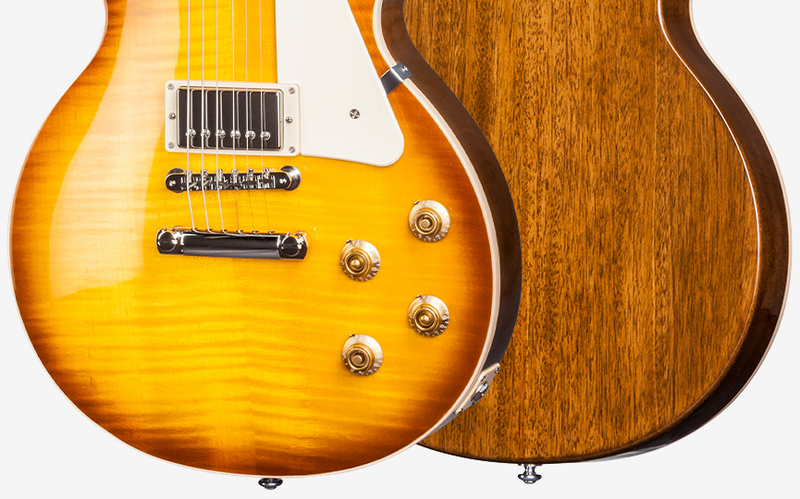 A Gibson Les Paul is a big purchase for guitar players: if a player is going for models above Specials and Studios, it’s important to make a good decision up front… So, let’s look at some of the objective things we can share that help players make decisions. The good news? If you choose one of the three types, Classic, Traditional, or Standard, you’ll have a GREAT guitar! There is NO wrong choice! Also to note, recent Gibson models (so far, 2016 and 2017 of all models like SG, Firebird LP, etc.) have a new “T” or “Traditional” designation – which is offered as an alternative to the new (2016-2017 so far) HP models. This is not the same thing as a Gibson Les Paul Traditional. Weirdly enough, you can have a Gibson Les Paul Traditional T/Traditional. That’s as opposed to a Gibson Les Paul Traditional HP/High Performance. I own a 2016 Gibson Les Paul Traditional Traditional. Fun, yes? Before we dive into the details: Know that Gibson has produced a HUGE array of Les Pauls over the past 60+ years. The Classic, Traditional, and Standard are only a small part of the models available to a guitar player… This review is just a conversation about these three particular extraordinary guitar models. Let’s start with the simpler, objective parts in summary so we can start with a clear understanding. The Gibson Les Paul Standard (in its original single-cutaway, non-SG form) has been around for quite a long time. 1958-1960, then 1968 to the present. The Gibson Les Paul Classic has been (to the best of my understanding) around since 1990 and has been made on and off until the present day in several different incarnations. The Gibson Les Paul Traditional is the most recent model of the bunch, as (to the best of my knowledge) it has been available since 2008. You can buy Gibson Les Paul Classic guitars at my favorite sponsor in the whole world! zZounds has great guarantees and prices! Note that these are generalizations of these models over their lifetimes… there might be differences between model years or even sub-models. This handy list is a general guide as opposed to a verbatim perfect enumeration of absolutes. All three models have carved maple tops (also called maple caps) some minor variations have special tops or are all mahogany – these non-maple-topped LPs are very unusual. All three models have bound bodies and bound necks – the binding is often different amongst the three, but binding is present. The binding on the body is on the front side only, covering the transition from maple to mahogany. Each model includes (typically) a four-control layout (V-V-T-T) Some Classics came with a mini-switch boost instead of a second tone. Each model includes some sort of three-way toggle switch in the upper bass-side bout, like Les Paul designed in the first LPs. Each model has the tried-and-true 3×3 machine head headstock/peghead. All three, in their every-day form, have a tune-o-matic style bridge and a metal stop bar and stud posts. Some varieties do get produced with tremolos or other tail treatments. The vast majority are stop-bar guitars. Each model (typically, with some exceptions) has two pickups and is largely comprised of two humbuckers – note that many times over the years, at least two of these models have been offered in 2xP90 or P90+Humbucker versions. Many specialized and store-specific versions have been popped out in recent years… There have been rare one-pickup models. All Gibson Les Paul Guitars are made in the USA. Although the Classic, Standard, and Traditional bodies are all bound, the binding is often different/thinner/different colors. In recent years, the weight of the body is very different from model to model. Traditionals are the heaviest, with some years being no weight relief and some being very little weight relief. The Standard, being the much older model, has had lots of iterations of body weight relief… it is often the lightest of the three models, but some old models are really heavy. Traditionals and Standards tend to have covered pickups, Classics have not (in my experience) had covers on the pickups. Classics and Standards of the past couple of decades have had metal sealed tuners such as Gibsons or Grovers. In my own 4 decades of experience, the most one-piece backs I have seen have been in the Traditionals, closely followed by the Standards. I have not yet seen a one-piece back on a Classic. Note that it is rare that Gibson actually says they will feature a one-piece back. I think the luthier who picks the wood from the stack will be the one to choose 1, 2, or (rarely) three pieces… it varies based on wood supply and supply quality. Each individual guitar is truly just that – an individual… I’ve seen great wood in the backs and I’ve seen not-so-good matches or wood in the backs – even on Standards. Traditionals tend to be thicker necks, often called “50s” necks. In my experience, Classics are almost always like the 60s neck profiles. They’re often the most like a “C” shape that’s fairly consistent from nut to heel. You can buy Gibson Les Paul Traditional guitars at my favorite sponsor in the whole world! zZounds has great guarantees and prices! Looking to buy a nice top-end Gibson Les Paul, but don’t have the funds for a Custom or a Custom Shop? Read these bullets and ask questions of yourself. Everyone else’s opinion is NOT more valuable than yours. If you like it, you like it – no matter what the salesman or the “old guitar guy” says (I can say that! I’m an OLD guitar guy!) As with almost anything involving humans, there tend to be Curmudgeons who want to tell you what you want because THEY know what’s the right answer! 🙂 Ignore them and trust yourself. First and foremost, know that if you buy any one of the three, Standard, Traditional, or Classic, you’ll get a GREAT guitar! You can’t go far wrong with any of the three. RELAX and enjoy! Ask yourself a few questions and answer them honestly. Often two of the models will fit your needs, sometimes all three! Does standing up with a fairly heavy guitar on a strap for a good while seem OK, or is it a problem? If you always sit, weight isn’t so much an issue and all three models will do fine. If you always stand and don’t have trouble with a bass or a heavy guitar, all three models are fine. If you find the strap painful and don’t like heavy guitars, try an Ultra-Modern Weight Relief or Modern Weight Relief Gibson Les Paul Standard. The next lightest is the Classic. Do you have small or large hands and/or fingers? If your hands and or fingers are short/small, the thinner 60s necks will do well for you, so either a Classic or a 60s neck Standard (there have been LOTS of both in the Standard line) will be the one for you. If your hands and or fingers are longer or larger, you might find the 50s neck to be more substantial and more comfy – that means the Traditional is right in your sweet spot, as well as a few specific 50s neck Standards. These are more like the old-time guitar neck shape. Do you want high-output sound, traditional (vintage) output sound, or medium output sound? If you want a more modern higher-output sound, the Classic is a great choice. This is not a 21 kOhm ceramic sound – it’s largely a 10 kOhm Alnico V sound particularly in the bridge. If you want vintage or moderate sound in the 7-8 kOhm range you can trust the Traditional to get you there. Most have Gibson’s 57 pickups – although I’ve seen some with Alnico II BurstBucker unbalanced coil non-potted covered pups. These are both sweet, nicely EQ’d humbuckers. It’s hard to go wrong here. If you want just a little more juice and a little more crunch without going modern (high 7 kOhm range to the low 9 kOhm range), the current-year Standard is the Standard (what’s in a name? 🙂 ). The standard has been offered different ways over the decades… much of the time with the original PAF humbucker, Bill Lawrence-era humbuckers, and MANY more… In the recent two decades Standards typically come with the Gibson 57, and more recently often with the BurstBucker Pro (Alnico V) pickups. 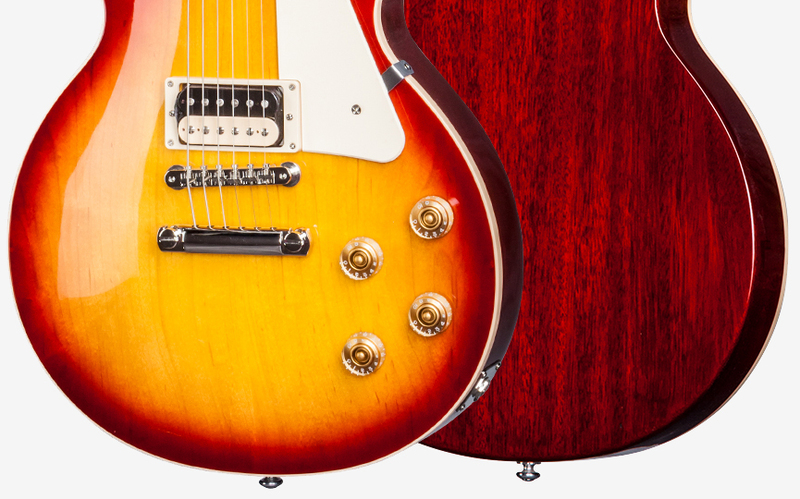 Gibson is always updating the Standard, and it still is the pinnacle of the desirable NICE Gibson Les Paul when it comes to the pickup sound. Does the LOOK of the guitar mean something important to you? Does it need to look like a 58-59 Les Paul, or does it need to look like something more recent? You can buy Gibson Les Paul guitars in a BIG array of models at my favorite sponsor in the whole world! zZounds has great guarantees and prices! So, to set up this opinion part of this review/article, let me start by saying that my preferences are my preferences. It makes me HAPPY for YOU to have YOUR own opinions, and you should like what you like, so I won’t go there (telling you what is “Best” for you). I have big hands and long fingers. I’m very tall, and I am strong as an draught horse. As a tendency, I like bigger frets (not part of this LP discussion) and thicker necks because they feel right in my hands. I do, however still enjoy flat or thin necks too! I think playing a library of very different guitars is great for my sound! For me, it’s an adventure. That said, when the chips are down, I like a substantial neck and a solid and heavy body to give me that tone and sustain I CRAVE CRAVE CRAVE. YES, I DO remember 50s Les Pauls (used, of course) on guitar store walls. YES, I have dreamed of the “golden years” Gibson Les Pauls. YES I have played them. NO, I cannot afford to own any of the originals. I’ve been watching them ever since. So for me, a “Les Paul” has always been a comparison to those great used Les Pauls of my childhood: snot-green Deluxe tuning keys, gorgeous yet simple maple caps and really GREAT well-feathered bursts, NIBBED binding on the neck, binding on the front of the body, two covered humbuckers, a yellowing or amber-ing switch tip, and those dark-aged-amber-gold-brown hat knobs. That will always be a “Les Paul” to me. But remember, that’s ME. You don’t have to see it that way :-). That’s what lights up my heart. But I’m a PolyGuitarist, so read on! Even though my childhood favorites had hat-shaped knobs, I find them VERY difficult to use for the subtleness of volume and tone changes. They feel slippery and are harder for my big fingers to grab. They’re even harder to use when doing a pinky-wrapped volume knob swell on the bridge pickup in Lead mode. I really always end up changing hat knobs of any kind out to speed knobs on my personal instruments. They just feel better. As much as I liked the absolute grab-ability of the super speed knobs of the 2013-2015 time range, I don’t like the sharpness of the knurls on the ends of them. So, just plain speed knobs for me, thank you. All the Classics I have ever played came standard with speed knobs. The Standards and Traditionals are truly a mixed bag. Since these are easy to change to one’s preferences, I wouldn’t recommend one model over the other based what kind of control knobs the guitar has. I love zZounds zero-interest payment plans A LOT! My latest Gibson Les Paul Standard is actually new to me and is a (yes, I LOVE it!) 7 string with a GORGEOUS AAA tobacco-burst top and dark back that is made with lots of love and is definitely one of my few life-long heirloom keepers. I’ve had others in the past that were wonderful, but I keep sticking with the Traditionals. I would have preferred a brown transparent back so I can see the back wood, but I’m OK for now, as the top is almost 3D! Interestingly, I found some Hipshot green-key buttons that fit nicely on the 7 Grovers on the Standard, so the guitar looks a bit like it’s a fancy old model with an extra string. I’ll review this guitar soon! I have really loved my other Les Paul Standard guitars – I’ve just been tending to stick with Traditionals these days. Finally, in the opines section of this writing, I’d like to say that my selected Les Paul Traditionals (2010 and 2016) are both SUPERB and practically play themselves. I sought and found both with one-piece backs, nibbed binding, 57 humbuckers, and Gibson Deluxe green-key tuners. They’re heavenly. The 2010 is an Ice Tea burst with a cherry back that was made on the painter’s best day of the year! The 2016 saw one of the nicest AA (borderline AAA) flamed maple tops I’ve ever seen with honey burst and a brown-stained back. Both have neck carves with which someone at Gibson TOOK THEIR TIME. I wish I had not sold my 2014 Gibson Les Paul Traditional: it had the super-hard-to-find Gibson 1959 Tribute Humbuckers in it, a one-piece back, had nibbed binding, and had one of the best inlay jobs I’ve ever seen on any Gibson. 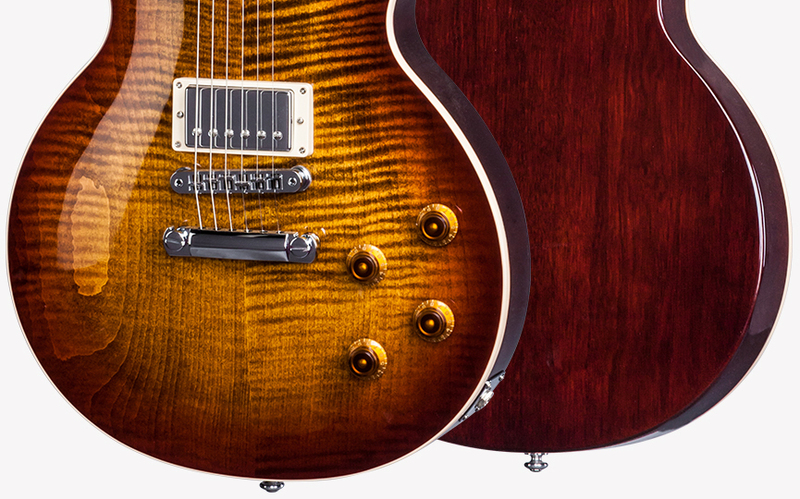 zZounds has a massive array of new and like-new Gibsons of lots of different models! Dear Gibson, keep innovating. Don’t listen to the nay-sayers who keep saying, “The only way to make a Les Paul is a copy of a 59 Les Paul Standard.” It’s always great to be able to buy a newly-built version of the 57-59 Les Pauls of great fame. But we don’t need ALL Les Pauls to be the same. Keep trying nuts, necks, bodies, electronics, and materials. Some things stick around (like BurstBuckers!) and some things don’t. It’s OK. I LIKE adjustable nuts and I LIKE the new easy-access heels. I don’t like the fret-end-over-binding necks (nib-less), but that’s ME as an individual… Try stuff, keep innovating! Dear Gibson, The 59 Tribute pups you put in the 2014 Traditional were awesome! Bring them back in other models! Not the BurstBucker 59s, the 1959 tributes! Dear Gibson, a 12th fret inlay kerfuffle from 2014 is not the end of the world, even though some traditionalists didn’t like the 120th inlay. Don’t be afraid to toot your horn… The 125th anniversary is soon! Dear Gibson, I love my Les Pauls. I love the variety, I LOVE the fact that two different individuals of a given model and year are slightly different. That way, lots of us can find something we love. Dear Gibson, I wish we could have optional Richlite on one of the Classic, Traditional, or Standard models. Even though some don’t like Richlite, I do! It’s like having ebony, but without having to cut down a millennium-year-old tree to get it. I am a person who likes sustainability. Dear Gibson, Please do the Les Paul Peace again, but this time with nibbed binding! I LOVE those! It wouldn’t hurt my feelings if we Gibson players and buyers could get factory cut and installed real bone nuts! This entry was posted in Guitar Review, Uncategorized and tagged classic, gibson, les paul, lp, premium, standard, traditional by Jim of Vivid Peace. Bookmark the permalink.